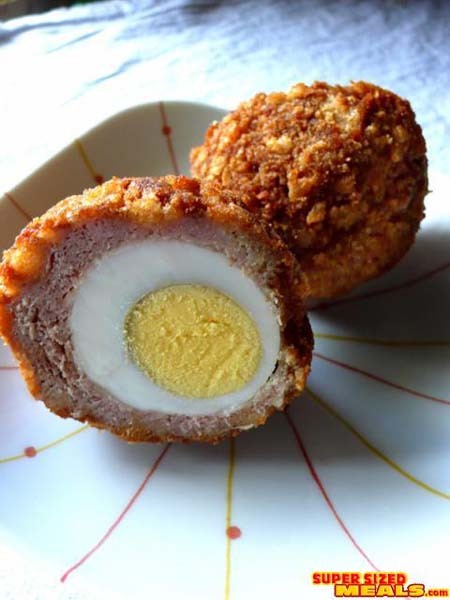 a hardboiled egg encased in sausage meat, rolled in breadcrumbs and then fried. fried. fried. peel eggs; divide sausage into 6 portions. roll each egg in flour then press and shape a portion of the sausage around each egg. dip sausage-wrapped eggs into beaten egg and roll in panko. heat oil to 350ËšF . cook each egg for 4-5 minutes (longer if shallow frying--constantly turn the eggs around for best results) or until sausage is cooked and browned.